A house in Warren, New Hampshire, was swept away and carried down a flooded river, crashing into a bridge. A home in Warren, New Hampshire, was swept away by floodwaters and destroyed after crashing into a bridge, and it was all caught on camera. The house on Studio Road was seen floating down the Baker River on a video taken by neighbor Tom Babbit. Seconds later, it gets crushed by a bridge, destroying all of Lisa Slade's belongings from a summer house that has been in her family for decades. "I just couldn't even believe it, just seeing it," Slade said. "Everything we own getting destroyed and crashing to the river was just the worst thing I had ever seen in my life." Fortunately, Slade and her children had just left the property the day before to head home to Hudson, but they had no idea that would be the last time they saw the house on land. 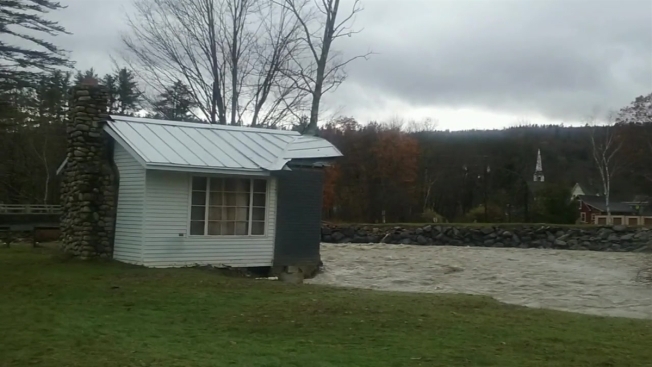 Going viral on social media, the wild video captured by Tom Babbit shows a home in Warren, New Hampshire, being swept down a raging river flooded during a recent storm before being destroyed. "Water is so powerful. It's unbelievable. You're just helpless," Slade said. All that is left is her living room, which is hanging on to a riverbank. Slade said she wants to rebuild, but she is worried about the river that she says has long been a danger. Town officials in Warren said two more homes are in danger of falling in, and they are having an emergency meeting Monday night to discuss the concerns. In the meantime, Slade's friends are raising money for her, since her home was not insured. Lisa's Cottage Fund can be found here.